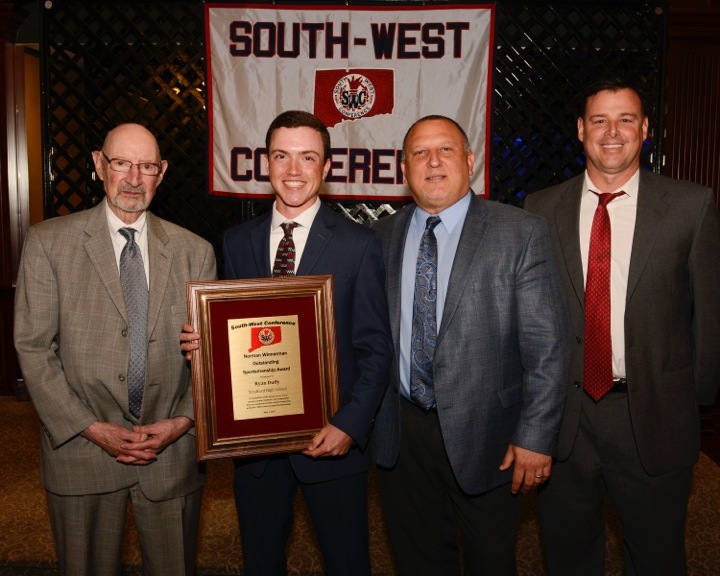 Twenty-eight South-West Conference member school student-athletes were presented Scholar-Leader Awards at the SWC's Annual Leadership Banquet held at The Amber Room in Danbury on Thursday, May 3, 2018. Recipients of this award have excelled in academics and athletics and have exhibited outstanding leadership qualities in their school and in their community. Twenty South-West Conference Unified Sports student-athletes were honored for their leadership and contributions to Unified Sports and Activities in the SWC at the Conference's Annual Leadership Banquet held at The Amber Room in Danbury on Thursday, May 3, 2018. The SWC Unified Sports One Athlete and One Partner Leadership Awards have been presented since 2016 to students from SWC member schools who have demonstrated commitment, dedication and service to Unified Sports and Activities at their school and in the South-West Conference. The South-West Conference is honored to present the Pamela Goodpaster “Outstanding Coach Award” to Bill Hunt of Bethel High School. 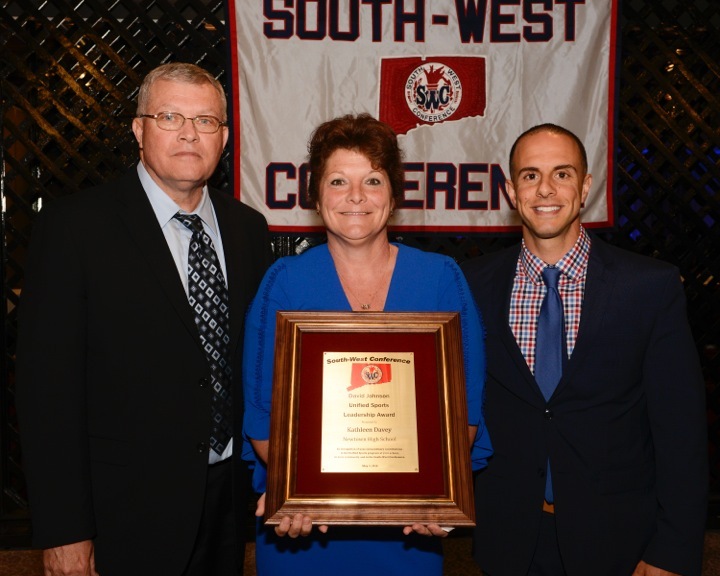 The Pamela Goodpaster “Outstanding Coach Award” recognizes an individual who has coached a minimum of ten years in the South-West Conference and displayed the highest ideals of sportsmanship, integrity and leadership. Throughout his career as a teacher and coach, Bill Hunt was committed to providing positive athletic experiences for students. 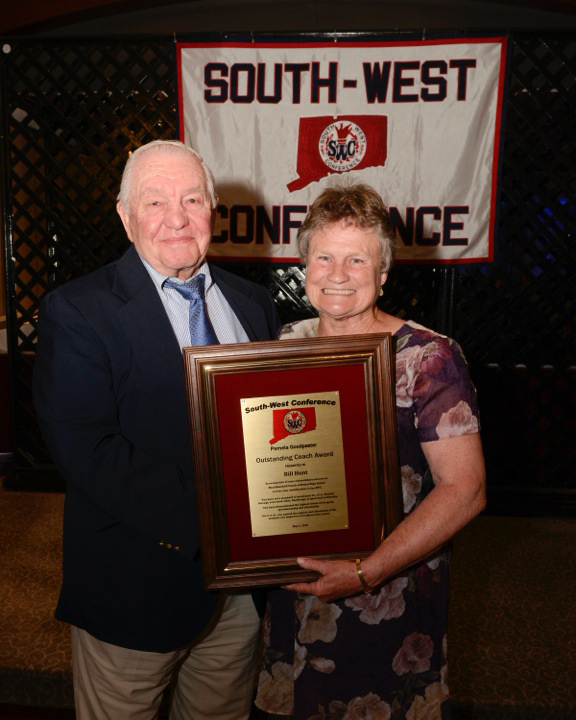 The South-West Conference expresses its deepest gratitude to Bill Hunt for all that he has done for his school, the SWC and the student-athletes whose lives he has influenced and impacted. Coach Hunt was an outstanding role model whose teams and student-athletes, win or lose, always conducted themselves with class, honor and dignity. Hunt is a graduate of Danbury High School where he played football, basketball and baseball for the Hatters. He earned his Bachelor’s Degree from Southern Connecticut and competed on the football team for the Owls. His first coaching assignment after graduating from college was junior varsity football at Danbury High School. From there he coached freshmen football, varsity basketball and varsity baseball at Immaculate High School. He was hired in 1964 as a physical education teacher at Bethel High School which began a span of five decades at the school coaching baseball, basketball and football. His tenure at Bethel High School included serving as Head Baseball Coach for 43 seasons (1968 to 2010), Assistant Football Coach for 33 seasons and freshmen basketball coach for 17 seasons. His resume even includes having served as Head Football Coach for one season for the Wildcats. It was Hunt’s baseball coaching career that certainly gained the most notoriety. He coached over 800 games and amassed over 500 wins as a head baseball coach at Immaculate High School and Bethel High School. His Bethel High School teams won two Western Connecticut Conference championships (1984 and 1991) and three SWC titles (2000, 2001 and 2005). Two of his Bethel teams advanced to the CIAC state finals (Class M in 1981 and Class L in 1991). His 1986 and 2005 teams made it to the Class L semifinals and four of his teams (1984, 1999, 2001 and 2002) advanced to the quarterfinals. Many of his players have gone on to play baseball in college including 2008 Bethel graduate Matt Barnes, who had an outstanding collegiate career at UConn and currently pitches for the Boston Red Sox. Hunt has been recognized for his coaching success and contributions to high school sports by a number of organizations. He was selected by the Connecticut High School Coaches Association as the “Baseball Coach of the Year” in 1992. The Bethel High School baseball field was officially named “William J. Hunt Field” in 2001 and he was inducted into the Bethel High School Hall of Fame in 2013. Pictured in photo (L to R): Norm Winnerman, Ryan Duffy, Stratford High School Principal Jack Dellapiano and Stratford High School Athletic Director Tony DeAngelo. Kathleen Davey of Newtown High School was presented the David Johnson Unified Sports Leadership Award at the SWC's Annual Leadership Banquet held at The Amber Room in Danbury on Thursday, May 3, 2018. Davey was recognized at the banquet for her dedication, commitment and contributions to Unified Sports at Newtown High School and in the South-West Conference. Davey, who is a teacher and coach at Newtown, has played a leading role in the success and growth of the Newtown High School Unified Sports and Activities program. Davey received her award at the banquet from SWC Commissioner Dave Johnson (left in photo) and Newtown High School Athletic Director Matt Memoli.